Wali Khan Mazari, above, meeting with community members. Bangla Ichha below. 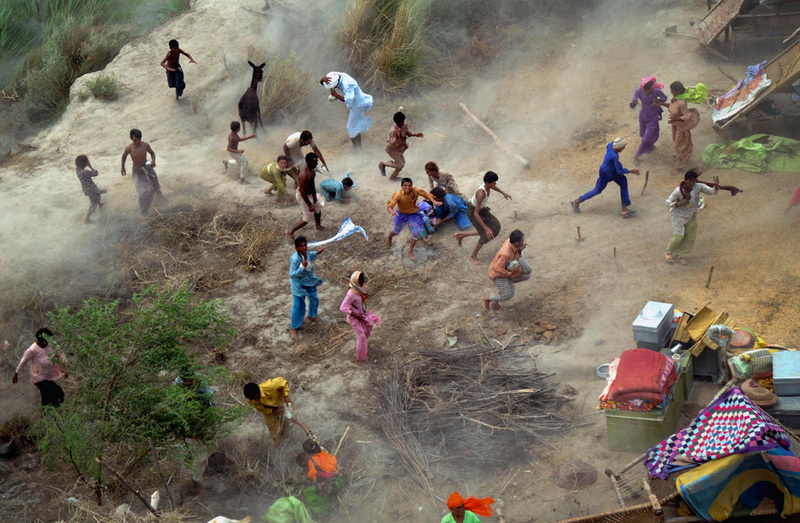 Back in July, when monsoon rains inundated Pakistan, there was no shortage of news about the floods. We received constant updates on the villages that were washed away, the homes that were submerged, the families that were displaced from their homes. We heard stories about children who were malnourished, about mothers who were vulnerable to disease. We inspired each other to raise money, to deliver relief items to the camps, to share in our collective humanity. But when the floods stopped, so did the news headlines. And as the ramifications of the disaster slipped further away from the front pages, our attention shifted elsewhere. I speak from personal experience. In August, we [my company, ML Resources Social Vision, along with Pakistani Peace Builders, and Indus Valley Productions] partnered to launch Relief4Pakistan, a grassroots campaign that leveraged social media platforms and people-to-people relationships to raise funds and awareness about the unfolding flood disaster. In our first phase, we decided to vet and choose an international relief agency working with a local team on the ground and delivering emergency first response relief effectively. We were lucky in many, many ways, mainly because we ignited the campaign amid the swell of citizen giving and awareness. We raised $150,000 in about two months, centralizing those funds to Mercy Corps. As we saw the success of the campaign grow and truly turn into a movement, our team was inspired to do more. Together with OperationUSA (an international relief agency, which, contrary to its name, is a privately funded charity focusing on community engagement and mobilization), we designed what we hope is a unique model for post-flood recovery, taking a community-based approach to address immediate needs and layer the initiative by partnering with social innovators working in housing, solar energy, education, and health sectors to have a long-term impact. We realized the key to success was partnership and collaboration, not trying to reinvent the wheel. We also knew we needed to focus on the areas that weren’t receiving aid or attention from the government or aid organizations, helping those communities falling through the cracks. That is how we came across Sardar Wali Khan Mazari, a tribal leader of the Bangla Ichha Union Council, a cluster of four villages in Rojhan, the sub-district of Rajanpur in southern Punjab. 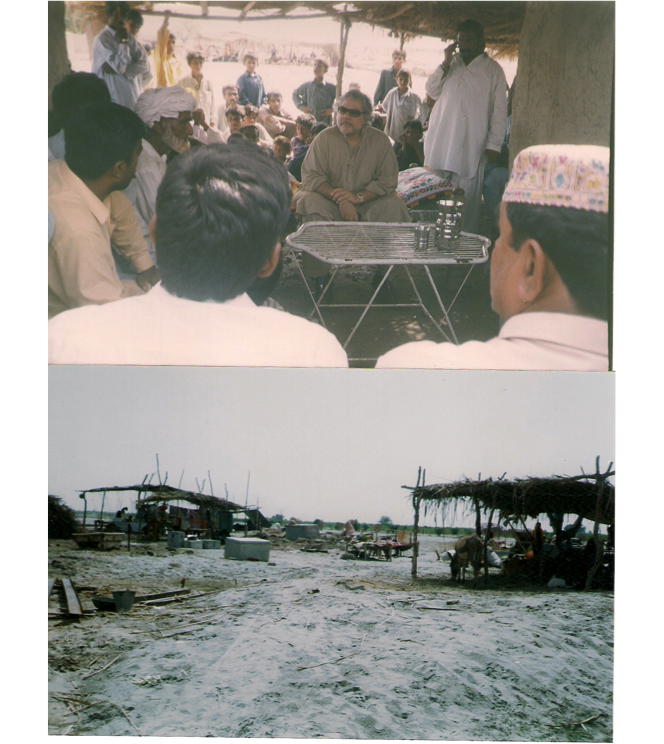 Rajanpur was one of the hardest hit areas of Pakistan, and Bangla Ichha, along the western banks of the Indus River, suffered tremendously. 2/3 of the population (30,000 out of 40,000) were displaced by the disaster, homes were destroyed (about 5,000), and 20,000 acres of farmland were submerged, resulting in tremendous ramifications for this heavily agrarian society. The people’s reaction, especially in Rojhan, has been overwhelming. They felt let down by the government and by some of their sardars who were ‘missing in action’ and weren’t providing any support. The poor people of the Mazari area of the district, besides needing aid, wanted someone to inspire hope, somebody who would listen to their needs. They wanted their leaders to stand beside them. Unfortunately, in many areas of Rojhan, this did not occur, perhaps because the concept of ‘giving back’ is absent from the vocabulary of these local leaders and government officials. Mazari’s desire to help his community and truly listen to the needs of his people were inspired by his late father, he said, who embodied the tribal values of insaan dosti (shared humanity), khidmat (service), and wafa (loyalty). Those values now inspire the Relief4Pakistan team, and remind us to always keep listening. For example, when we first met Mazari (through Zeyba, one of our team members), we had grand ideas of social innovation and what we wanted to introduce to the Bangla Ichha community. While many of those ideas will be undertaken at later stages by our social enterprise partners (EcoEnergy Finance, for example, will be sending solar lanterns to the community and will potentially install a solar lighting system in the area), Mazari instead convened a meeting with members of his community, asking them about their immediate needs. The answer was unanimous. The community, most of whom are poor farmers, needed wheat seeds and fertilizer in time for the planting season. They needed to restore their livelihoods. Our team was humbled and learned a big lesson – in order to ensure sustainability, the local community not only needs to be engaged, but they also need to be listened to. Through gifts in-kind, (via the Rohi Foundation/United Nations FAO and the Imran Khan Foundation), we quickly received enough wheat seeds to restore 3400 acres of crops, just one month into this second phase. OpUSA often is able to work in remote areas heavily affected by disasters, villages that have no other form of external support. This approach in Pakistan has ensured Operation USA’s aid has ‘filled in the gaps’ left by larger INGOs and UN agencies, and supported community-driven initiatives – increasing both the efficiency and sustainability of long-term development projects. Across all of our programs we have seen civilians regain control over their own lives with adapted housing and livelihood support. We have seen communities develop their own local NGOs to advocate for rights and services from the government. And we have seen decreased rates of maternal mortality with an intervention as simple as a vehicle adapted for use as an ambulance. This is not a shameless self-promotion post. This is a story of how a group of like-minded citizens, an international relief agency, and a tribal leader with the moral integrity to help his people had the courage to be audacious and the humility to collaborate. This is also an appeal to join our movement, to give when it’s no longer trendy, and to remember the millions affected by the floods when no one else will. Support the group that speaks most to you, but, really, just continue supporting. Because as the cold weather encroaches on the 18.1 million Pakistanis still affected by the floods, they need us to continue to remember them. When I was 11 years old, my family moved to Islamabad, Pakistan from Dhaka, Bangladesh. As a child in the noisy and buzzing city of Dhaka, I had seen my share of hanging meat and animal blood in the marketplaces. I still have a vivid memory of a chicken running around with its head cut off as our cook wielded a butcher’s knife in the patch of grass behind the kitchen. That was very frightening. It wasn’t until I moved to Pakistan though that I met my first goat. I should mention here that my friends have dubbed me Elmira from Tiny Toons, due to my borderline obsession with all things furry and cute, and my desire to unabashedly “hug ’em and squeeze ’em.” When I was 11, a spray painted goat arrived at our house. He was a pretty goat with a fabulous coat, spray-painted with neon pink and orange swirls. He bleated pathetically in my direction as I ran breathlessly up to him. We became friends. It may have been one-sided. I called him Goatie. Needless to say, Eid ul-Azha came soon after, and our family feasted on a meal of biryani with gosht. It wasn’t until later, upon learning of Goatie’s mysterious disappearance, that I put two and two together – I had eaten Goatie. Apparently, I wasn’t very smart either. 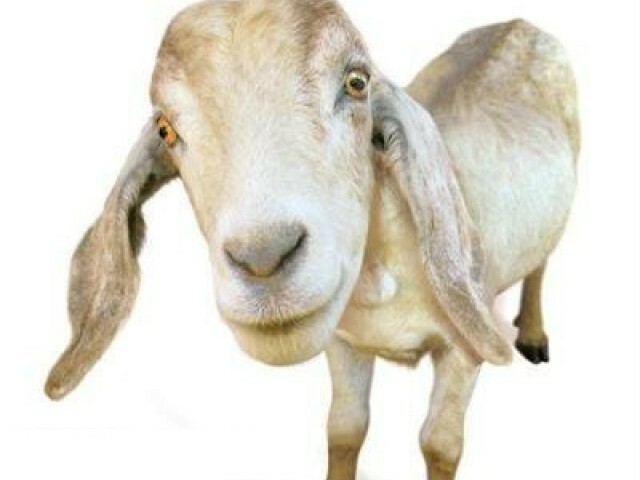 I relate that story, dear readers, because it’s Eid ul-Azha today (or tomorrow for others) – otherwise known as Bakra Eid, the religious holiday where we sacrifice a goat to commemorate the story of Abraham and Ismail. It symbolizes a test of faith and a time when we share with others less fortunate than us, Muslims and non-Muslims alike. In Pakistan, Eid is a wonderful flurry of sights and sounds – bangles clinking, lights strewn everywhere, colorful new clothes, and children laughing with their pockets fat with Eidi. It is a time for family and celebration, but it’s also a time for reflection, particularly for the millions of families who are still without their homes in Pakistan because of the recent flood disaster. Eid for them won’t be a cheery holiday of new clothes and colors, but a painful reminder of all that they lost in the tragedy. Even if their stories have been muted from the news headlines, we should remember them in our prayers on this day, and we should give what we can to ensure their recovery. 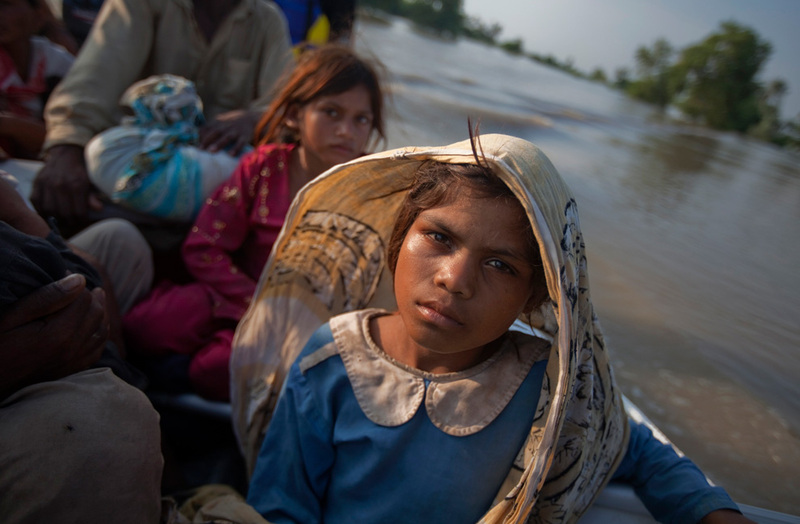 You can give to your relief organization of choice, or please give to our flood relief campaign Relief4Pakistan, which launched its second phase last week. It is an innovative recovery program developed in partnership with international relief agency Operation USA to restore the livelihood of families living in Bangla Ichha Union Council, a cluster of four villages in Rajanpur, Punjab not receiving sufficient aid and support from the government. We are working closely with the local community organization and tribal leadership to ensure the sustainable recovery of this community through local investment and engagement. To learn more, click here. Suhani Bunglani fans flies away from her two baby girls as one sleeps motionless while the other stares without blinking at the roof of their tent, her empty belly bulging beneath a green flowered shirt.Their newborn sister already died on the ground inside this steamy shelter at just 4 days old, after the family’s escape from violent floods that drowned a huge swath of Pakistan. Now the girls, ages 1 and 2, are slowly starving, with shriveled arms and legs as fragile as twigs. According to UNICEF, about 105,000 children younger than five years old are at risk of dying from severe acute malnutrition over the next six months. This past Friday, the World Health Organization (WHO) stated that ”risk is very high” that waterborne diseases such as cholera could spread and cause large numbers of deaths, with 57 confirmed cases in recent weeks. Prior to the floods, Pakistan’s economy was already declining, with a third of the population under the poverty line. According to the LA Times, “Now, in the aftermath of the flooding, officials face the daunting task of preventing complete fiscal collapse.” Here are some numbers – up to 21 million have been affected by the floods. 10 million are homeless. The floods have swept away 70% of roads and bridges in affected areas. In those same areas, over 10,000 schools and 500 hospitals have been destroyed or damaged. PM Gilani has stated that losses from the flooding could reach $43 billion, with the inflation rate, previously projected to reach 9.5% in 2011, now expected to climb as high as 20%. What does this all mean? It means that we are in for a very, very tough road ahead. It means that more parents like Akram, who so tragically ended his life Monday, will be left without a way to provide for their families. It means that millions of people, just a year after the last displacement crisis in Pakistan, will be further dependent on handouts. And it means that the disaster is far from over even after the headlines go away. But as the floods subside and we start assessing and tackling the second phase of relief – reconstruction – we also need to remember how little these villages had to begin with before the floods. Handouts are necessary in providing immediate relief to these affected families, but in the long-term a strategic plan must be developed to address very complex development gaps. In the first six-eight months, families will need food, shelter, and clothing. But in the medium and long term, they will also need livelihood skill-building, livestock, fertilizer and seeds to restore their [mainly] agrarian households. In order to decrease families’ dependency on handouts, there must be continued community investment and capacity-building. There must be accountability and transparency. In short, there needs to be more than what we were able to give many of these areas before the floods. I’ve blogged extensively about our campaign, Relief4Pakistan, which has raised over $140,000 for emergency first response relief in Pakistan by leveraging social media platforms and people-to-people relationships. We are currently developing an innovative model for this next phase of reconstruction that will target villages that aren’t receiving aid, and will foster collaborative networks and community investment in the process. We are all – Pakistani and non-Pakistani alike – in this together because we are all human beings that have witnessed one of the worst natural disasters in recent history. Regardless if you continue to talk about the floods to someone you meet or you are on the ground doing relief work, we all have a responsibility to keep this conversation alive. Wait. Let me get this straight. Pakistan is suffering from over a month of flooding – the worst natural disaster in decades – that has impacted over 20 million people, and we are spending millions on statues? But here’s the real question – if the alleged $11 million is coming from taxpayers money, then why didn’t the government previously direct such funds towards flood-affected families? More importantly, the late Benazir Bhutto always at least claimed to be a populist leader. In the spirit of her memory, wouldn’t it therefore make a lot more sense to use that exorbitant amount of money for the people of Pakistan? Recently, the Pakistan Consulate in New York City wasted an opportunity to appeal for donations for the flood-affected people in Pakistan on the NASDAQ screen in Time Square. Instead of broadcasting images of the tragedy or messages about the floods, the Consulate showcased photos of bureaucrats standing in front of the Pakistani flag, which flashed on the giant screen. Between that, Gilani‘s visits to fake relief camps, and this new proposed statue, I am increasingly disgusted with our government and their inability to shed more than crocodile tears for the citizens of Pakistan. I’ve felt very drained by the news of late. Cricket players implicated in a spot-fixing scandal. A flood disaster of epic proportions, affecting millions of people and requiring billions of dollars in long-term humanitarian assistance. Political violence and targeted killings in Karachi. 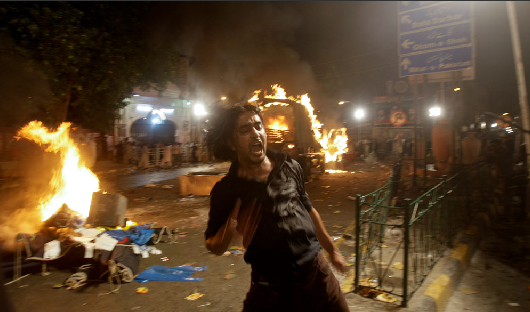 A triple bombing that targeted a Shiite procession in Lahore, killing 25 people and wounding 150 others. A firing on another Shiite procession in Karachi, all during the month of Ramadan. A photographer captured the above image yesterday, following the triple blasts in Lahore that targeted a Shiite mourning procession. The man is running from the explosions caused from protesters burning vehicles, after the attacks incited clashes between mourners and police. Children are also at high risk of malnutrition and water-borne diseases. 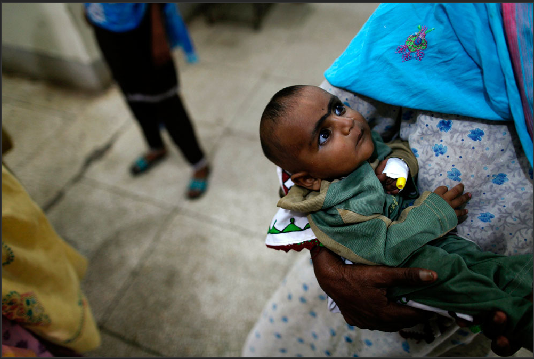 The above image depicts a mother holding her baby suffering from diarrhea at an overcrowded clinic in Sukkur, Sindh. According to UNICEF, the floods have affected nearly 8.6 million children. 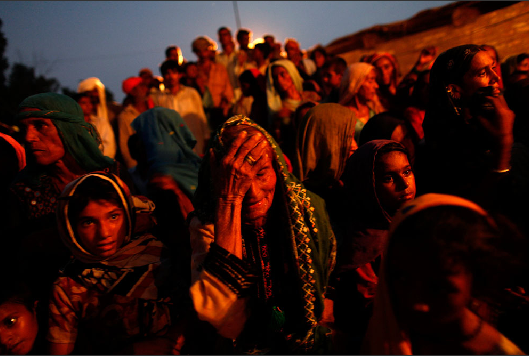 Above, another powerful photograph, taken as flood victims gather outside a police station in Sukkur, awaiting food. According to a statement, the World Bank has increased its flood-related support to Pakistan from $900 million to $1 billion. As the inflation rate is expected to climb from 15 percent to 20 percent, the government announced that the floods damaged $1 billion of crops, causing food shortages. The Food and Agriculture Organization (FAO) has called for funds to replace half a million tons of wheat seed stocks destroyed by the floods, with planting of the staple due to take place over the next three months.